What’s good? This BMW Streetguard suit is a two-piece suit that replaced my old Hein Gericke suit, and it took some getting used to. 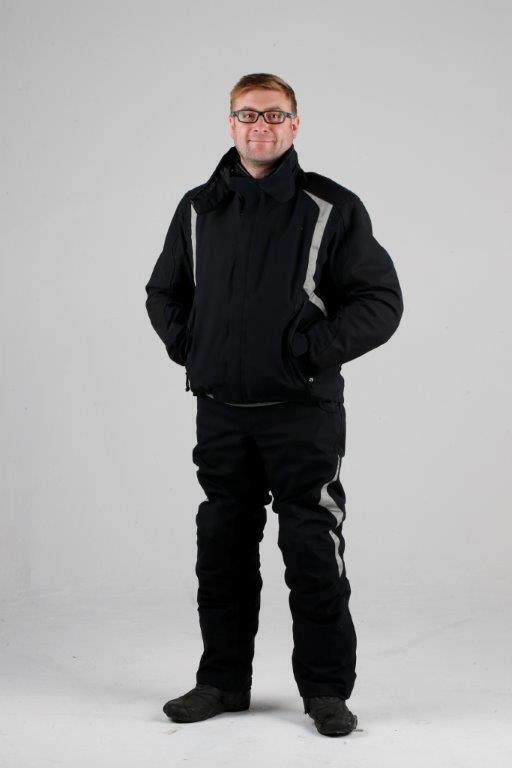 The warmth, waterproofing, armour, practicality and sheer quality are amazing. I wore this suit for a 2500-mile trip over four days across Europe and it was near faultless in conditions ranging from 40C heat through to 750 miles of lashing rain and temperatures of 4C. I don’t wear it on a daily basis but for long trips where the weather is too unpredictable for leathers it’s perfect. The material has a compound which is said to reflect heat so you don’t get too hot which does seem to work well. What’s not? It’s wallet-smashingly expensive. There aren’t enough pockets on the outside of the jacket and it means I have to faff about finding the interior ones for the likes of stashing my phone and wallet. After riding for almost a whole day in heaving rain back from Italy I was wet under the jacket. I don’t think it leaked; it appeared water had been blown down between my waterproof neck warmer and the jacket. Annoying, but I’m not sure any jacket would have fared better. I think the option of zipping the jacket and trousers together is reserved for Olympic gymnasts. I have stopped risking knackering my back after a few pathetic attempts at getting the zip to go all the way around. Even trying to get them zipped together while laid on the floor has proved almost impossible.